Piazza del Campidoglio - The tour starts in Piazza del Campidoglio, the ancient acropolis where the shouts of the invading Gauls echoed in the depths of the night, and where a maiden guilty of high treason was cast from the cliff that takes her name, into the depths of the ravine into which the corpses of outcasts were thrown. Today, we see the square in all its beautifully balanced Renaissance splendour, thanks to the complete redesign promoted by Pope Paul III Farnese and carried out by none other than that all-time Master, Michelangelo. The terrace overlooking the Roman Forum, the heart of Republican Rome – From the Capitoline hill we pause to look out, in delight and admiration, over the imposing ruins of what was once the beating heart of the ancient city, the Roman forum, which developed from the Seventh century B.C. and remained in use until the fall of the Roman Empire. 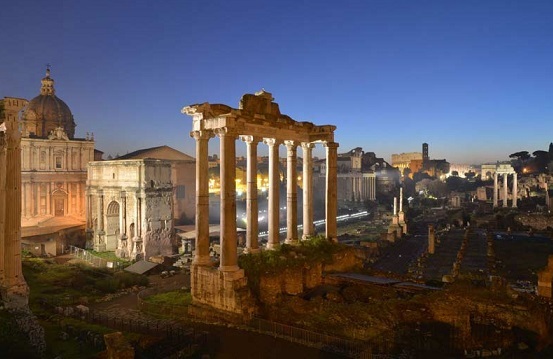 The remains of the most important buildings, such as the Temple of Saturn, the Curia, the Arch of Septimius Severus, the Temple of Castor and Pollux, emerge from the shadows of night and the past thanks to the attractive diffused lighting, which provides us with a truly unique spectacle. Trajan's forum, the Forum Augustum, the Forum Nerva and Vespasian – After descending the Capitoline Hill we continue our route along Via dei Fori Imperiali, pausing first of all before Trajan's Column, that document of exceptional importance in Roman official celebratory art, erected as a permanent testimonial to Trajan's great military enterprises in Dacia early in the Second century A.D. We then continue in the direction of the Forum of Augustus where, between two exedras covered with rich polychrome marbles, once stood the Temple of Mars Ultor, erected by Octavian after the victory at the Battle of Philippi. This is followed by the Forum of Nerva, whose Temple dedicated to Minerva, erected by the Emperor Domitian, was stripped of all its marble and then demolished by Pope Paul V Borghese early in the Seventeenth century, to provide materials to build the Acqua Paola fountain in the Janiculum! At the point where modern day Via Cavour joins Via dei Fori Imperiali, the common thread running through the whole of our walk, we will cross what remains of the great Forum built by the Emperor Vespasian using the spoils from the Jewish-Roman War and the conquest of Jerusalem, which took place in 70 A.D. 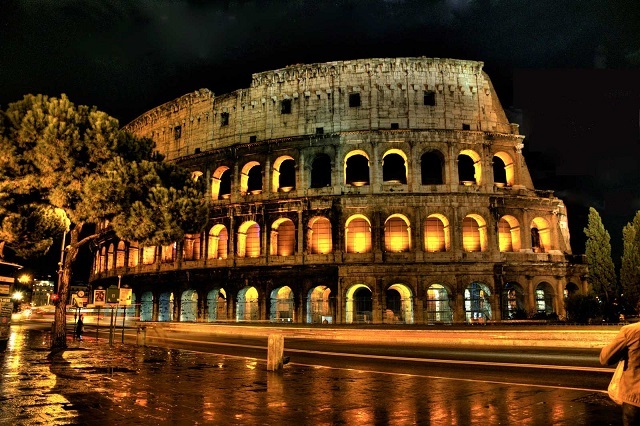 The Amphitheatrum Flavium, the symbol of Rome's eternity – “Rome will live for as long as the Colosseum stands, and when it falls, Rome and the whole world will fall with it”. It was thus that, in the early Middle Ages, the steps of the great amphitheatre, now deserted and windswept, echoed to the sinister and troubling words of the prophecy of the Venerable Bede, a monk living between the Seventh and Eighth century, who wrote the Historia Ecclesiastica Gentis Anglorum, thanks to which he gained the title of the Father of English History. But for now at least the Colosseum, the unique and genuine symbol of Rome and its eternal destiny, shows not the slightest sign of yielding, and offers itself to our nocturnal perambulations in all its majesty. It is here that our evening tour ends, leaving us enchanted by the tales of atrocious fights between gladiators and the many other legends and mysteries tied to the most famous monument in the history of mankind! Meet in Piazza del Campidoglio under the statue of Marcus Aurelius; cost of participation: adults €28, young people under 18 €18, children under 6 years of age free. For information and bookings, please call 0692939974; 0766840578; mobile 3281640180; or write to segreteria@romoloeremo.com, leaving the necessary details for us to contact you; payment on site to the guide, who will carry a Romolo e Remo sign.